"Muse, say, fool, look in thy heart and write." Such is the impulse that powers the work in Christian Anton Gerard's second book, Holdfast. The poems are laser-tipped with ache, with longing, and ultimately with personal redemption. They do not flinch from confrontation of poet to self as speaker, who lingers in the dangerous intersection of dependence and deliverance. This collection represents a searing introspective reckoning yet veers from the confessional: the poet opens the door to his soul, reveals the wreckage in the "blue room," and identifies it: "Whiskey's voice." In the poem, "Defense of Poetry; or Prayer in Recovery," he writes, "This is not a plea for redemption. This is not//a plea for restitution, though it is a thought moving/toward such a thought." The collection arcs from alcohol addiction, the misplaced self, to setting right the wreckage and arriving in islands of joy via love, faith and poetry itself. the vigilance required to stay hidden and then admit. The disassociated voice serves as a rhetorical device which enables identification with these various figures, and highlights the diffusion of identity, a necessary prelude to self-discovery. The poet creates an authorial distance between the Christian Anton Gerard of his poems, at a remove from portrayed self: a chorus of I's. Yet an intimate internal dialogue is at the same time established, such that poet/self and speaker move back and forth from confrontation/brokenness to affirmation/healing. On my knees. In this night. How do you know? My Hope is open. Through the three parts of the collection a progression toward wholeness is enacted via dialogue with the alcoholic, fractured and guilt-bound self who works to "understand forgiveness' shape" in part one, to the recovering self, wrestling with faith with his sober presence with his family in part two, moving to a more integrated self freed to love in all directions in the final section. This progression is, naturally, non-linear: in the first section, for example, we find a poem titled "[Because there are nights that seem to put one arm first]" which flows into the opening line, "on a ladder toward day." Here is the poet figuratively climbing into daylight/recovery. Perceptions are already shifting, as in the penultimate stanza, the speaker states, "I used to think flowers were fireworks celebrating//the dark not eating me." dangle like ghosts I can't grip, can't stop gripping. in a poem it's the way I ask the sky to sing. against your beard, knows she'll ask why you're crying. Your poem's whole life before and behind it. will jump inside your chest's pocket, your fingers on her spine. you'll say, I want to read you this story I love. Blooms a bud that had been whorled in upon itself in the third section of Holdfast. Poems anchored in love petal in the direction of "her," of God, nature and numerous poets, and of Poetry, capital P. Eros emerges, intense and joyous. One of the many wonderful examples is found the final section of "Christian Anton Gerard to Her Sort of in the Style of a Teenaged Love Poem:"
asleep last night―my voice fire-pop and invitation. and yes and you and yes. Yes. I dreamt your voice. Breath in my ear. I woke a tulip field at sunrise. I want my sweat to taste like good, good labor, and dirt and grass. I want my name to taste like that in your mouth. bullfrogs and crickets, ducks running on the water into dusk. at sunset―a fox howl made his heart beat different. 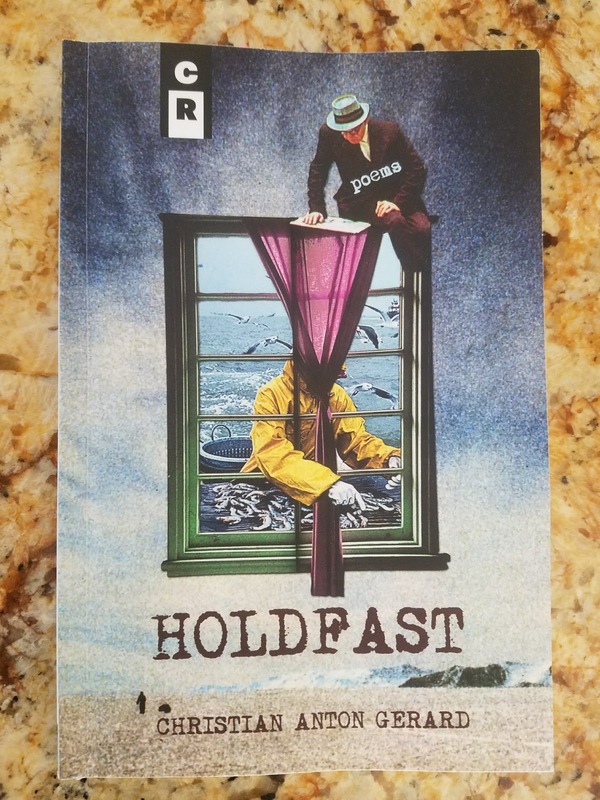 The poems in Holdfast are dense with image, allusion, figures from literature, science, popular culture, mythology all in service of a soul in progress: the Christian Anton Gerard of these moving and often breath-taking poems. The poet has laid down a template for a poetry of brave and vulnerable disclosure in a language refreshingly original, surprising and absolutely rewarding. The poet in no wise hesitates to follow the advice in his "Defense Prayer:" "Muse, say, fool, look in thy heart and write. 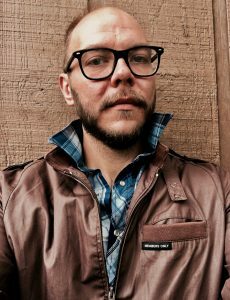 Christian Anton Gerard is the author of Holdfast (C&R Press, 2017) and Wilmot Here, Collect For Stella (WordTech, 2014). His work appears widely in national and international magazines. Gerard has received scholarships from the Bread Loaf Writers’ Conference and the Prague Summer Program, Pushcart Prize nominations, an Academy of American Poets Award, and the 2013 Iron Horse Literary Review Discovered Voices Award. When he’s not working, Gerard can be found fishing (usually just standing next to oceans, lakes, or rivers), learning to work wood (avoiding the ER), or indulging his love for home improvement projects of all kinds (after watching hours of do-it-yourself YouTube videos).